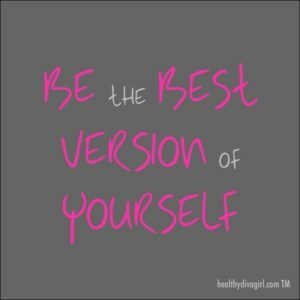 The concept of becoming your best version keeps swirling around me. It has been consistently said in motivational videos that I watch, it is a section in a book that I am currently reading, my Mentor/Coach talked to me about it recently, and it has come up in other conversations. God is trying to get my attention and I want to share my thoughts on this subject with all of you. So, what is becoming your best version all about? It is about a few things, finding your purpose, finding your “place” in life, developing the values and characteristics that are important to you, and being comfortable in your own skin. Finding your purpose – The concept of finding your purpose is nothing new. It is consistently focused on because it is so important. When you get down to it, it is really what life is all about. Why am I here? Why was I born? What am I supposed to be doing with my life? Am I mistake? So, just how do you find your purpose? Here are a few tips: ~ From God – Prayer, reading the bible, and developing your relationship with God are tools to help you find your purpose. You need to go to the One who made you to find out why He made you. ~ Identify your talents – Many times our talents are connected to our purpose. Are you creative, good at cooking, writing, cleaning, making people look beautiful, making people laugh, providing medical care to people, building houses, taking care of children, etc. Ask yourself what are you naturally good at? What gives you joy? What do you “like” to do? What would you do if money was not an issue? These answers often lead you to your purpose. ~ What challenges have you faced? – Oftentimes a challenge, illness, life experience, or something you have “been through” leads you to your purpose. Many organizations, movements, and non-profit organizations have been created because of a person or family member experiencing a disease, abuse or some sort, discrimination, etc. People take these experiences create something or choose a career to help others in the same situation. This is a positive way to use negative or challenging experiences. Instead of staying stuck in the pain, turn it into motivation and help others. Finding your place in life – What do I mean by this? There are many different ways to live in this world. Let’s take where people live as an example. Are you a city woman, suburban, country, nature, on the sea, in the wild!? What about diet – do you identify with being a vegetarian, a vegan, are you a healthier eater, or do you enjoy it all!? Money is another identifier – do prefer extravagant living, or a frugal lifestyle? How you feel about money and lifestyle is a good way to find your place. Do you care about and support social causes? Are you into politics? Are you a social person who enjoys spending time with friends and out on the town? All of these things and more display your personality, your lifestyle, and your heart. Another way to say it is finding your “tribe.” Finding where you fit in and feel comfortable is important to finding your place in the world. Values – What are your values? Love, honesty, generosity, adventure, health, family, etc. Some people have values that are focused on the negative – revenge, punishment, death, taking from others, etc. What!? You mean everybody is not a “good person” with “good values”…..no! This is a topic for another day, but please do not go around in this world thinking everybody is good and/or like you. Here is the thing about values. A person may list a page full of “good” values, they may “say” their life is all about love, generosity, health blah blah blah, but none of it is true. It just sounds good. What do your actions say? You say you care about love and being good to people but you are mean as hell. You say that you care about your health, but you consistently put toxins in your body. You say care about your appearance but you look a mess lol…..I’m just saying, let’s be real people. You are not fooling anybody but yourself. People will know your values by your actions. You have to be deliberate about it. The key is to “build” the values that you identify as important to you. Be comfortable in your own skin – This is about self-esteem and self-acceptance. Are you happy with your appearance? There are some things about our appearance that we can change, and some things that we can’t. If there is something about yourself that you want to change and you can, then by all means change it! Things like losing weight, a new hair style, a new wardrobe, etc. can be changed and are a big part of who we are. Even when people say “I don’t care about all of that” that is a category, and they look like they don’t care! As for the things about ourselves that we can’t change, this is where self-acceptance comes in. There is no sense in getting caught up in things like height, body type, race, etc. because you can’t change it. If you have an issue with the basics about yourself, it came from somewhere and you have to do the internal work to deal with it. Those issues need healing in order for you to become comfortable in your own skin. For example, skin complexion is still an issue in the African American community. You may have been teased, heard negative comments, or even had family members to put you down because of your skin complexion. This is wrong and it saddens me that we do this to each other in our race, especially as women. Accept who you are, you are beautiful. Becoming your best version is about becoming the best YOU that you can be. You do not have to be a model, a millionaire, a brain surgeon, feed all the hungry children in Africa, have a PhD, be a size 0, and be married to a rich, fine, basketball player to have a good life!!! Your life is just as important as anyone else’s, and you can have a great life no matter what your circumstances. We are all important, special, beautiful, and we were all created by God. However, we may not all live up to our potential, and that is where choice comes in. Choose today to become the best version of yourself. Finding your purpose, your place in this world, displaying the values that are important to you, and being comfortable in your own skin is a good place to start! If you have more tips to help each other feel free to leave them in the comments below. If you have a story of how you became your best version feel free to share that story with us below. And finally, if you want to declare to the world that you choose to start your journey of becoming your best version, then by all means leave that in the comments as well so we can celebrate with you! I love you all and let’s make this a great year!